Using live sound current and yoga to elevate, deeply heal, transform, and awaken your spirit to its unlimited potential. Answer the call of your soul and immerse yourself in Spirit. Complete the life transforming “Naad: the Awakening” 10 - day Kundalini Yoga Kriya with live sound current to elevate, deeply heal, transform, and awaken your spirit to its unlimited potential. The course creates a healing bridge for you to merge and synchronize with the oneness of the universe. Join us in the calm of the foothills of the Himalayas and between the holy cities of Haridwar and Rishikesh to free yourself from past attachments, gain a new perspective, create new connections and make powerful shifts in your life. We are joined by the extraordinary young Master Ragis, the Baba Fateh Singh Khalsa Jatha who play Kirtan in the Golden Temple daily. Our practice is supplemented with daily yoga and meditation, sacred Offerings in the Cave Temple at the Ganga and sunset Aarti Fire Ceremonies. Recreation space is given for rest, exploration, shopping, and inner contemplation. After our stay at the Ashram, we'll experience the luxury that India has to offer, staying at the world class, five star Ananda Spa, then spending 4 nights at comfortable lodgings in Amritsar, where we visit the Golden Temple and listen to sacred Gurbani Kirtan sound currents. Check out pictures from our past Yatras to India here. Situated near the banks of the Holy River Ganga, Aurovalley is located between the spiritually rich cities of Rishikesh and Haridiwar, home of the classical yogis. The ashram is a sanctuary for contemplation and spiritual growth and the perfect environment for deep meditation. Swami Bramdev, the spiritual teacher, and founder of Aurovalley, offers teachings based on the philosophy of Sri Aurobindo and the Mother. During our stay, we are invited to Swami Bramdev’s satsangs and the silent meditation held in the ashram each evening. We have 2 days of relaxing and cleansing in Ananda Spa once voted #1 destination spa in the world by Conde Nast, Ananda Spa is situated in the foothills of the Himalayas. Here we enjoy the tranquil meditative vibrations of Shri Ananda Mayi Ma’s hermitage, do sadhana and make offerings at the Wishing Tree Temple at Kanjapuri in the Himalayas. 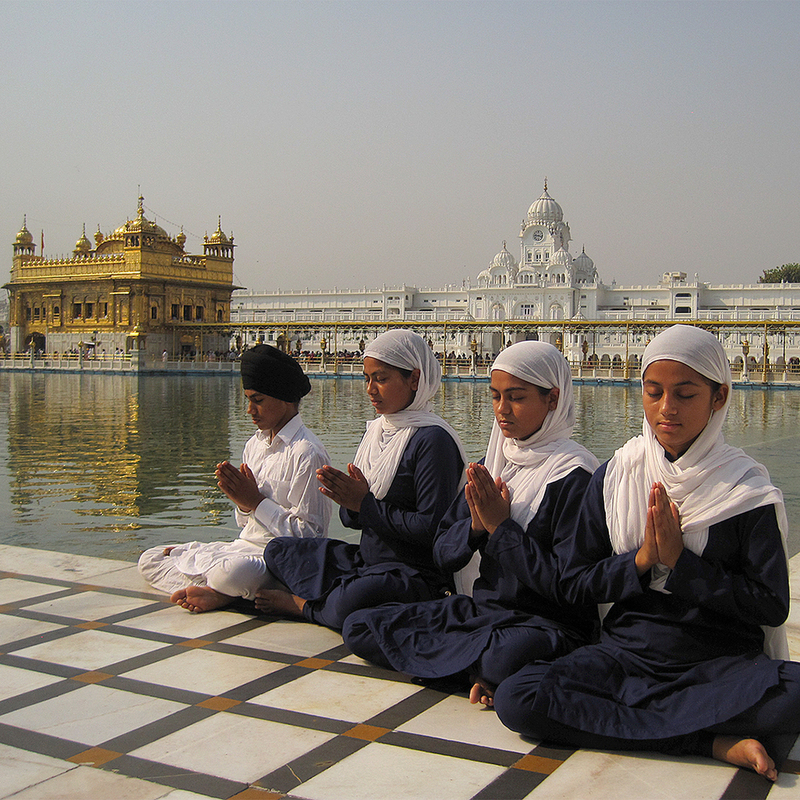 The Harmandir Sahib is a sending station of Gurbani Kirtan, the sacred sonic algorithms of expanded consciousness. Here we do the Seva of washing the marble Parkama, we chant the Nam and present ourselves before the Siri Guru Granth Sahib, the healing living vibration of Original Truth. We are fortunate to be joined by the Young Master Ragis, Baba Fateh Singh Jatha who play Kirtan at the Temple in the Golden Temple daily. Their presence embodies Khalsa Spirit and invokes Kundalini Shakti.